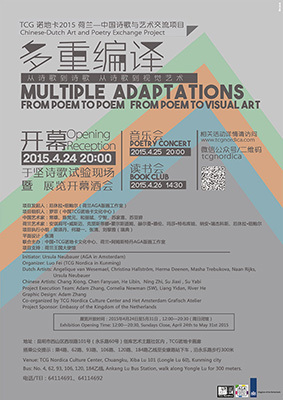 The project consists of an art exhibition based on poetry and accompanied by poetry readings. The participants are six Chinese artists working with the TCG Nordica, a Kunming art center with strong ties to Scandinavia and six Amsterdam artist/printmakers from the Amsterdams Grafisch Atelier (AGA). The initiative came from Ursula Neubauer, a longtime member of AGA, who had visited Nordica in November 2012 and met there its artistic director Luo Fei. She found the quality of the Kunming artists and the broad spectrum of activities at the art center very impressive. Nordica, located in an old factory building, radiates a strong communal spirit. It shares the riches of culture with a wide range of visitors via exhibitions, cinema, poetry readings, theater, dance, and a café. AGA is an excellent counterpart to Nordica, for it is vibrant and innovative, with two living/working spaces for artists-in-residence which attract many international artists and interns to work there. Ursula Neubauer’s prime motivation to organize this long-term project is curiosity about a distant culture, belief in joint projects that expand one’s horizon, and challenge to work in a larger context. She shares these motivations with all the participants, especially Luo Fei, artist, curator and artistic director of Nordica. The concept of the project was worked out in a joint effort of both sides. The basic idea is that each individual artist correlates a translated poem from the other country with his or her art work. 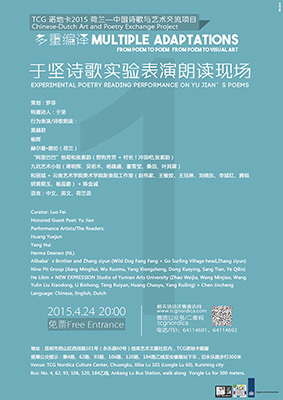 The readers, viewers, and listeners will thus be presented with a multidimensional and performative exhibition: The poems will be printed or written on long banners, as integral part of the exhibition. At the opening of the exhibition they will be recited in Chinese, English, and possibly Dutch. 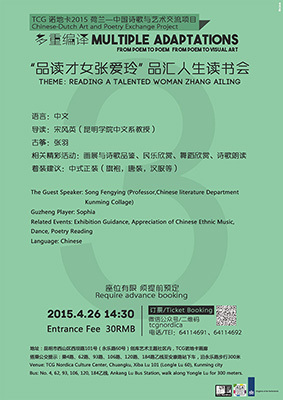 Discussions on poetry and adaptations/ translations could be included in the event. The AGA artists have followed the suggestion of Luo Fei to focus their work on poems by Yu Jian, a well-recognized poet and documentary filmmaker from Kunming, whose works have been translated into many languages. The Dutch artists will present large innovative prints on paper or fabric. The Kunming artists are free in their choice of medium with the exclusion of three dimensional works. 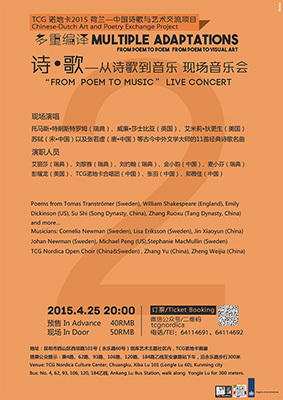 They chose their poems from the volume ‘Moderne Nederlandse Poëzie’ translated into Chinese by M.van Crevel. The project will be presented in Amsterdam and Kunming. Bus: No. 4, 62, 93, 106, 120, 184乙线, Ankang Lu Bus Station, walk along on Yongle Lu for 300 meters.